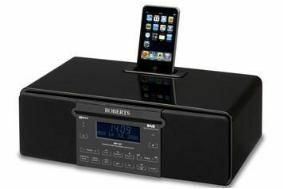 Roberts delivers Sound 43 digital sound system | What Hi-Fi? And those functions in full? Well, it's a DAB/FM radio complete with CD player and iPod dock, plus of course on board amplification and stereo speakers. What's more you'll find alarm clock, sleep and snooze functions, plus aux in and a headphone socket. Touch screen controls add a luxurious touch to the high-gloss piano black finish, while there's an electric blue display and a fully functional remote control. The Roberts Sound 43 is available to buy now and should set you back around £200.